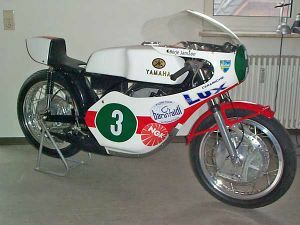 1972 saw the appearance of the last official “mass produced” air cooled Yamaha production 250cc roadracer, the Yamaha YDS7 based TD3. Overall it was a little disappointing. 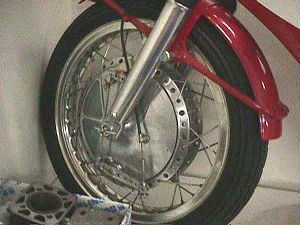 On paper it, and the 350 TR3, seemed a revelation with their dry clutches, new lighter frames, horizontally split crankcases in common with the 350 as well as an identical crank , 6 speed transmissions, with provision to allow sixth gear to be “blocked out” if rules required it, (though a 5 speed was released initially which also had a wet clutch), gear ratios changed as well. 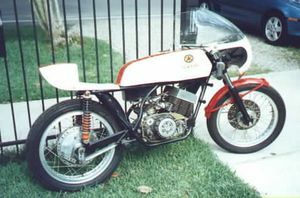 On the track the TD3 suffered chronic detonation problems which were extremely difficult to sort out**. Some of these problems may have stemmed from the un-reliability of newly fitted for this model CDI ignitions. 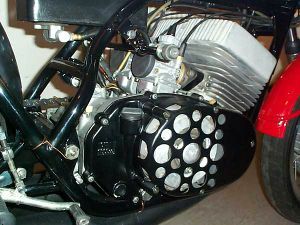 34mm carbs appeared on spacer blocks. 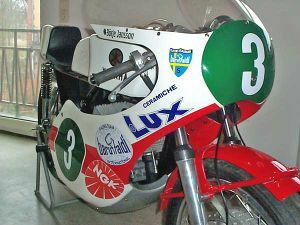 Changes to the motor included reduction in the height and width of the main transfers, increased width of secondary transfers, deepening and widening of the main inlet port, as well as the usual updated exhaust. Output jumped up 2bhp to 49@10,500rpm. Once you know the four significant differences it is fairly easy to tell them apart. 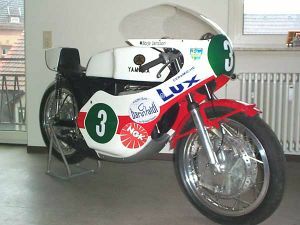 Firstly the TD2 had a replica of the RD56 frame whereas the TD3 had the frame from the road bike. 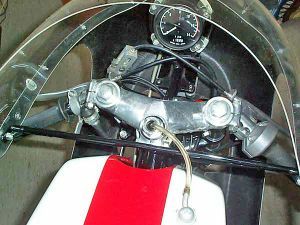 The main difference is the tube from the top rail down to the swinging arm. On the TD2 it is a gentle curve in true featherbed fashion but on the TD3 it is straighter and goes in at the top. 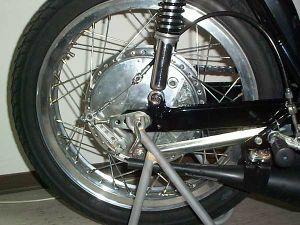 The next difference is the forks, on the TD2 they are black but on the TD3 they are an aluminum colour. The engines probably show the most differences. 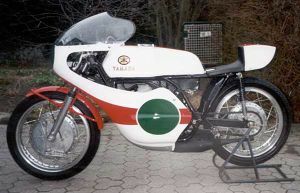 The TD2 has a tuned engine from the YDS6 road bike with aluminium coloured cases, barrels and head, with the fins of the latter smaller and more rounded. 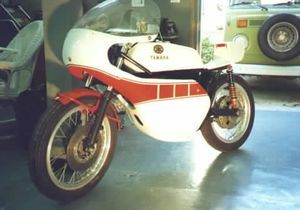 The engine in the TD3 is from the YDS7 road bike with horizontally split cases and black end covers, the finning is deeper and squarer on the head. Finally the fuel tank is looks bigger on the TD3 and is slightly wedge shape sloping narrower towards the back whereas on the TD2 the top and bottom edges appear parallel. This page was last edited on 21 January 2011, at 18:48.